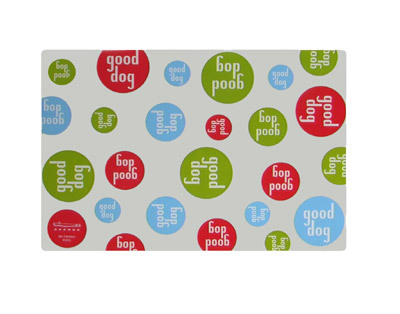 This feeding mat comes in two sizes to accommodate large (or especially ravenous) dogs or multiple pets. The jumbo mat can fit two of our large-sized bowls side by side. Vinyl placemat stays put and wipes clean with a sponge. 18″ long and 12″ wide.